This morning, however, the image resurrected from my past was that of 3D LILA. 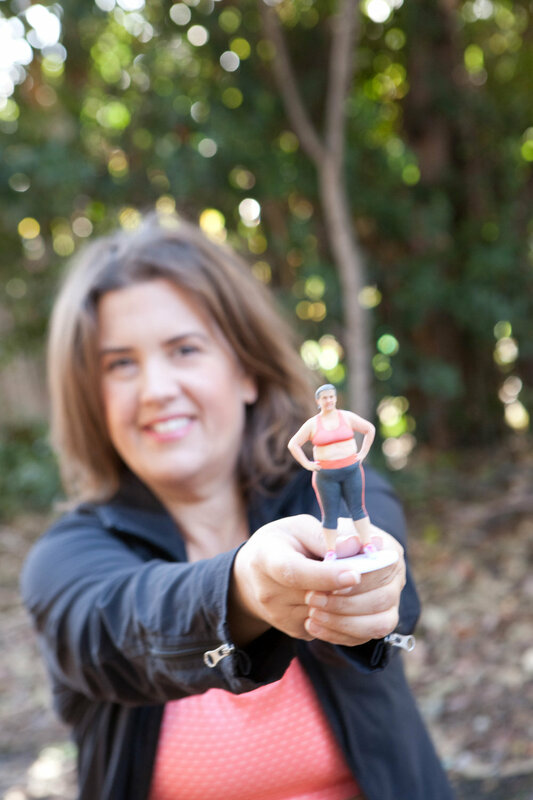 A 3D printed miniature version of myself in full color looking like I’ve just stepped on the scales of The Biggest Loser. Awesome isn’t it? I know, I was a tiny bit insane. When I saw this photo, I gasped. At that time I was unemployed and had been told by a former mentor, “Just tell people you’re playing tennis.” I had NO clue what I was doing to do with my life. I had ideas, all sorts of ideas but no leads. As I found myself, for probably the first time since I was about 15, without a steady paycheck, a mortgage, and a slightly expensive husband. I was just a tiny bit panicked. I heeded my mentor’s advice, and instead of jumping wholeheartedly into the job search, I played. Tennis? No, I have the hand-eye coordination of a donut. Learn how to create a podcast? Lose some of the stress weight I’d gained on my previous job? Totally. Hence the idea to bring podcasting, 3D printing, and a weight loss journey together was born. I had no idea it would change my life. Change my life in ways that I just couldn’t have imagined. 3D LILA led me to the TED stage. And it was standing in line at TED that I (quite rudely) told a Microsoft Executive she was “boring.” It was that same Microsoft Executive that asked me six weeks later for a proposal. I remember thinking, “She’s going to pay me!” I gave my freshly developed presentation in Redmond, and Kathy was the recipient of one of my very first introduction makeovers. And I kept building from there. Today I’m flying to NYC to kick off a 6-month program with the awesome women of Yext. This program combines all the lessons learned from both before and after 3D LILA was created. However, this empowerment program would never exist if I hadn’t created LILA in the first place. As I shared my Facebook memory, I wish I could have gone back in time to that day. I would whisper in my ear that day and tell myself that things were going to change in amazing and wonderful ways. I wish I had been able to reassure myself. But it doesn’t work that way, does it? We don’t get messages from the future telling us that our slightly crackpot ideas are actually the idea that will change it all. What I do know because I’ve seen it happen over and over again: When you create something that is 100% you, it all seems to work out. Something bold, authentic, compelling and unique. There’s something like that in you. If you had the time and the curiosity, what would you create? So Happy Birthday 3D LILA. Who knew you were the gift!